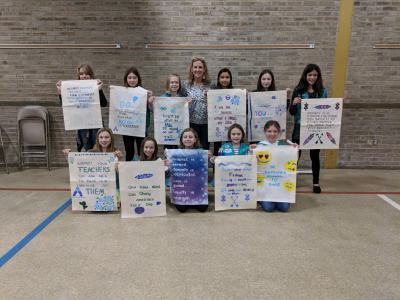 Members of Girl Scout Junior Troop 2357, out of the Homestead-Wakefield Chapter, recently earned their Bronze Award by completing a project within their community that they felt would bring about a positive change. The girls decided to spread a positive message about respect and kindness through banners that will be displayed around their school. Work on their project began in September. The girls raised all the money to buy the materials to make banners by having a Stop-Drop-Shop babysitting night in December. Then, they selected and voted on the messages that would be placed on the banners. Finally, the girls presented their projects on March 29, 2019, at the school's monthly Paws to Celebrate Award Ceremony. Way to go, Troop 2357! Pictured are HWES 5th grade students (left to right), back row: Emma Belman, Hannah Gregory, Ashley Shelton, Mrs. Kelly Blackburn (troop leader), Maggie Leitzer, Anna Fonner, Haley Rudd; front row: Oksana Davids, Lily Orsburn, Caroline Bates, Addison DuBose, and Michaela Blackburn.